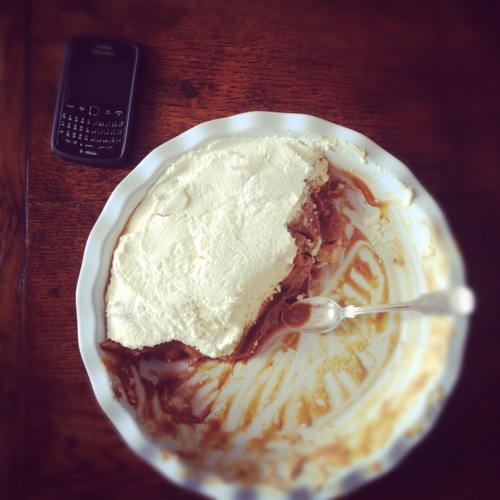 Look at the size of this massive Banoffee Pie, a sweet giant. We used to make this pie all the time at uni in England, and typically downed it with a Malibu and Coke cocktail. Fine living indeed. Given just how insanely sweet this pudding is, it would probably benefit from a more sour cocktail. But wait, who has pies and cocktails at the same time?! Don't screw up as I did recently and buy evaporated milk by mistake as I was in a hurry. This recipe calls for sweet condensed milk. It also requires boiling the condensed milk in their tins for about two hours so bear that in mind time-wise. Two tins of condensed milk; one packet of chocolatey biscuits such as digestives.. but if those are hard to come by, chocolate chip cookies will work finely; one stick of melted butter; one pint of heavy cream; three bananas (overripe is good); a healthy splash of rum; three tablespoons of brown sugar. 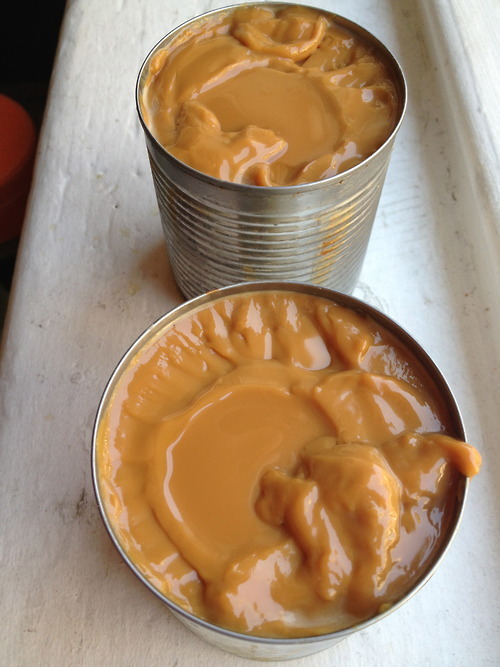 Boil the condensed milk tins just as they are for two hours in a pot, preferably one of your older, less fancy pots. Keep a lid over most of the pot, just allowing a little bit of steam to escape. Make sure the water doesn't get low, it must always cover the tins. In other words, don't decide to go out and do a spot of shopping for two hours as you'd return to the pot cooking on empty. Bad idea anyway. Crush up the biscuits into crumbs, and add 3/4 of the melted butter. Then using the damp biscuits, pat them into the bottom of a pie tin as the base for the pie. Slice up the bananas and saute them in the remaining butter with the brown sugar. After about two minutes, by which time the bananas will have softened and have begun to caramelize, add the rum and stir for another minute and then turn off. Whip the heavy cream until it turns into whipped cream. (You'll likely have spare left over which you could turn into butter. Bonus!). Put into the fridge while the condensed milk keeps cooking. Two hours later... run cold water over the cans of milk. Open them up slowly and carefully (you risk having caramel squirted across your kitchen if you're too hasty), and pile the soft caramel onto the pie base. Once that's done, then layer the rummy bananas on the caramel. Then gently cover all of the pie with a layer of whipped cream. Throw into the fridge for an hour or two so that the pie hardens up and is less sloppy. This pie is heaven. But you really only need a few bites to be satisfied because it's so sweet. Susan cooks and writes at Living MacTavish.